Lori at Creating Beauty in the Kitchen and Nimmi at Adorable Life nominated me for this wonderful award. If you don’t know Lori at Creating Beauty or Nimmi @ Adorable Life then you have to drop by and pay them a visit. Both have the best blogs!! Lori is making some changes to her blog …awesome stuff!! She has a wonderfully fun and creative blog with great recipes and a new section for DIY …she is truly creating beauty everywhere! Nimmi’s blog, Adorable Life is filled with tasty recipes, how to’s – tips and information. You will find everything you need there to make the most unique and delicious dishes. 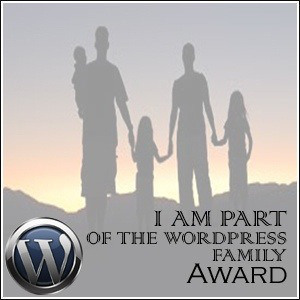 Thanks to all of my fellow bloggers for reading my post! I appreciate your kind nomination Arlene. Very generous of you. Many thanks. You are very welcome Sue! Thank you, Arlene! You very well deserve this award. And regards to Lori too. I go check her out in a while. Thank you, and I love your blog! You are welcome! Thanks again for the nomination! 🙂 Happy day to you!